A pacemaker is a small electronic device that helps regulate a slow heartbeat. The pacemaker is usually implanted in the chest, just below the collarbone. Your doctor may recommend this device to keep your heartbeat from slowing down to a dangerously low rate. The heart is a pump made up of muscle. The muscle is stimulated by electrical signals. These signals normally follow a specific circuit within the heart. These signals organize contractions of the different parts of the heart. This makes it beat at a rate that keeps blood flowing around the body the way it should. A pacemaker may be needed when there are problems with the electrical signals in the heart. Your heart may sometimes beat too slowly, or at an irregular rate. A pacemaker is made of 3 parts. They include a pulse generator, 1 or more leads, and an electrode on each lead. A pacemaker signals the heart to beat when the natural heartbeat is too slow or irregular. Why might I need a pacemaker? Your healthcare provider may advise a pacemaker when your heart beats too slowly and this can't be fixed with other treatments. A pacemaker will cause a faster heart rate. Problems with the heart rhythm may mean your heart is not pumping enough blood to the body. If your heart rate is too slow, the blood is pumped too slowly. If the heart rate is too fast or too irregular, the heart chambers are unable to fill up with enough blood to pump out with each beat. Medicines are often used to slow down these fast heart rhythms. But the medicines can also result in slow heart rates when the rhythm is normal. When the body does not get enough blood, symptoms such as tiredness, dizziness, fainting, or chest pain may occur. Bradycardia.This is when the heart beats too slowly. Tachy-brady syndrome. This is characterized by alternating fast and slow heartbeats. Heart block. This occurs when the electrical signal is delayed or blocked as it travels through the heart muscle. There are several types of heart blocks. Your healthcare provider may have other reasons to advise pacemaker insertion. Lead displacement. This means the wires of leads of the pacemaker become disconnected or displaced. You may need another procedure to reposition them. There may be other risks. This depends on your specific health condition. Be sure to discuss any concerns with your healthcare provider before the procedure. How do I get ready for pacemaker insertion? Your healthcare provider will explain the procedure to you. He or she will ask if you have any questions. You will be asked to sign a consent form. This gives your permission to do the procedure. Read the form carefully. Ask questions if anything is not clear. You will need to fast (not eat or drink) for a certain period before the procedure. Your healthcare provider will tell you how long to fast, usually overnight or at least 8 hours before the procedure. Tell your healthcare provider if you are pregnant or think you might be, or if you are breastfeeding. Be sure your healthcare provider knows about all medicines, vitamins, herbs, and supplements that you are taking. This includes both prescription and over-the-counter medicines. Tell your healthcare provider if you have a history of bleeding disorders or if you are taking any anticoagulant (blood-thinning) medicines. This includes aspirin, or other medicines that affect blood clotting. You may need to stop taking some of these medicines before the procedure. Tell your healthcare provider if you have heart valve disease. You may need to take antibiotics before the procedure. You may need a blood test before to the procedure. This is to see how long it takes your blood to clot. You may need other blood tests and a chest X-ray as well. You may get a sedative before the procedure. This is to help you relax. If a sedative is used and you go home right afterward, plan to have someone to drive you home. You will likely spend at least 1 night in the hospital after the procedure. This is to watch your heart and make sure the pacemaker is working the way it should. What happens during pacemaker insertion? A pacemaker insertion may be done on an outpatient basis. Or it may be done as part of your hospital stay. The procedure may vary depending on your health and how your healthcare provider does the procedure. You will be asked to remove any jewelry or other objects. You will be asked to remove your clothing and will be given a medical gown to wear. If there is a lot hair at the incision site, it may be shaved off. An IV (intravenous) line will be started in your hand or arm before the procedure. This is to give you medicine and fluids. You will be connected to an electrocardiogram (ECG) monitor. This records the electrical activity of your heart. It monitors your heart during the procedure using small, plastic electrodes that stick to your skin. Your vital signs will also be watched during the procedure. These include your heart rate, blood pressure, breathing rate, and oxygen level. You will get a sedative in your IV before the procedure to help you relax. The skin at the pacemaker insertion site will be cleaned with antiseptic soap. A local anesthetic will be injected into the skin of the chest at the insertion site. Once the area is numb, the healthcare provider will make a small cut (incision) at the insertion site. A sheath is put into a large blood vessel. The sheath is also called an introducer. It is usually put under the collarbone. The sheath is a small plastic tube. The provider will thread the pacer lead wire or wires through this tube into the blood vessel and advance them into the heart. It will be very important for you to stay still during the procedure. This is so that the catheter does not move. This helps to prevent damage at the insertion site. The provider will thread the lead wire through the sheath into the blood vessel. The provider will advance the lead wire through the blood vessel into the heart. A type of moving X-ray is displayed on a TV screen (fluoroscopy) may be used to help check the location of the leads. Once the lead wire is inside the heart, it will be tested to be sure it’s in the right location and it works. There may be 1, 2, or 3 lead wires inserted. This depends on the type of device your healthcare provider has chosen for your needs. The lead wire is attached to it to the pacemaker generator. Then the provider will slip the generator under your skin through the incision just below the collarbone. The generator is often placed on the non-dominant side. This means if you are right-handed, the device will be placed in your upper left chest. If you are left-handed, the device may be placed in your upper right chest. The pacemaker will be checked to be sure that it is working correctly. What happens after pacemaker insertion? After the procedure, you may be taken to the recovery room or returned to your hospital room. A nurse will watch your vital signs. Tell your nurse right away if you feel chest pain or tightness, trouble breathing, or pain at the insertion site. After a period of bed rest, you may get out of bed with help. The nurse will be with you the first time you get up. He or she will check your blood pressure while you are lying in bed, sitting, and standing. Move slowly when getting up from the bed. This is to prevent dizziness. You will be able to eat or drink once you are fully awake. The insertion site may be sore or painful. You can take pain medicine if needed. Your arm may be placed in a sling overnight. Your provider will give you specific instructions about activities you can and can’t do. He or she will talk with you about how to keep your arm from moving after the procedure. You will have a chest X-ray to make sure your lung was not injured during the procedure, and to check the device position. You may be prescribed antibiotics. These are to help prevent an infection around your pacemaker or at the incision site. Once your blood pressure, pulse, and breathing are stable and you are alert, you will be taken to your hospital room. Or you may be allowed to go home. It’s common to spend at least 1 night in the hospital after a pacemaker implantation. Make sure to have someone drive you home when you are discharged. You should be able to return to your normal daily routine within a few days. Your healthcare provider will tell you if you will need to wait. Don't lift or pull anything for a few weeks. You may also need to limit movement of your arm on the side that the pacemaker was placed. You will most likely be able to go back to your usual diet, unless your healthcare provider tells you differently. Keep the insertion site clean and dry. You will be told how to bathe or shower safely. Your healthcare provider will give you specific instructions about driving. Ask your healthcare provider when you will be able to return to work. The nature of your work, your overall health, and your progress after surgery will determine how soon you may go back to work. Call 911 if you have severe chest pain or trouble breathing. After a pacemaker insertion, you will need to keep regular appointments to ensure the pacemaker is working the way it should. The healthcare provider uses a special computer, called a programmer, to review the pacemaker's activity and adjust the settings when needed. A remote monitor may also be used to allow the pacemaker to be checked at your home via the internet or telephone. Always carry an ID card that states you have a pacemaker. You may want to wear a medical ID bracelet or necklace saying that you have a pacemaker. Let security screeners know you have a pacemaker before going through security detectors at the airport or court house. In general airport detectors are safe for pacemakers, but the small amount of metal in the pacemaker and leads may set off the alarm. If you are selected for additional screening by hand-held detector devices, tell the screeners that the detector wand should not be held over your pacemaker for more than a few seconds. This is because the detector wand contains magnets that may affect the function or programming of your pacemaker. Most modern pacemakers are safe in an MRI machine. Check with your healthcare provider before having an MRI scan. Don't go near large magnetic fields such as power generation sites and industrial sites such as automobile junkyards that use large magnets. Don't use short-wave or microwave diathermy that uses high-frequency, high-intensity signals. This may be used in physical therapy to treat muscles. The signals can interfere with or damage your pacemaker. Turn off large motors, such as cars or boats, when working close to them. This is because they may create a magnetic field. Don't go near high-voltage or radar machinery, such as radio or television transmitters, electric arc welders, high-tension wires, radar installations, or smelting furnaces. If you need a surgery in the future, tell the surgeon that you have a pacemaker well before the operation. Ask your cardiologist if you need to do anything before, during, or after the surgery. Ask about the safety of the electrocautery device often used during surgery to control bleeding. This may interfere with the pacemaker. 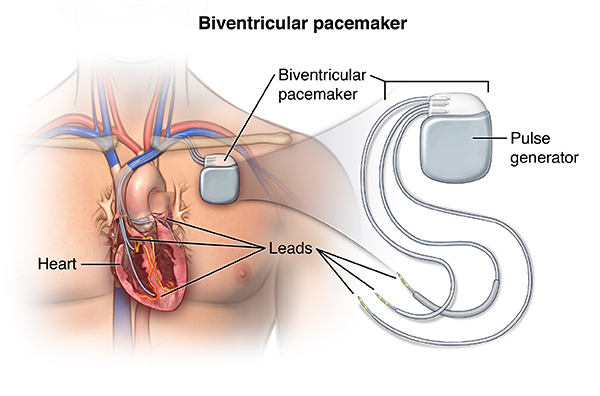 In some cases, the pacemaker's programming will be temporarily changed with a magnet during the surgery. This is done to lessen the risk of interference from the electrocautery. During any physical or sports activity, protect yourself from trauma to the pacemaker. A blow to the chest near the pacemaker can affect its function. If you are hit in that area, see your healthcare provider to make sure your pacemaker is working the way it should be. Cell phones in the U.S. with less than 3 watts of output don't seem to affect pacemakers or the pulse generator. But to be safe, keep cell phones at least 6 inches away from your pacemaker. Don't carry a cell phone in your breast pocket over your pacemaker. Talk with your healthcare provider if you feel ill after any activity, or if you have questions about starting a new activity. Always contact your healthcare provider if you have any questions about using any equipment near your pacemaker. Your healthcare provider may give you a list of other devices and procedures to avoid.